This is the oldest surviving bridge over the river in the city. 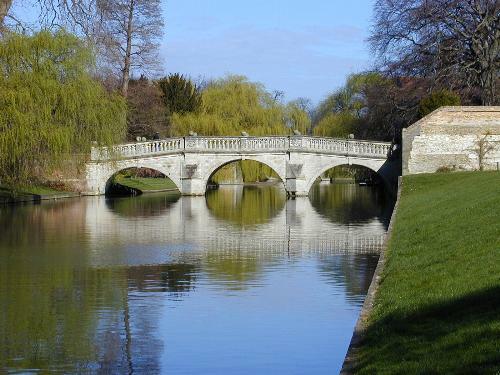 It is considered by many to be the most beautiful of the bridges across the Cam, even though it sags slightly in the middle. As can be seen, each railing has a series of balls placed on top. The second ball from the left on the nearer railing (so the first ball to the right of the leftmost willow tree) has a slice taken out of it on the river side. One story has it that this happened because Grumbold was not fully paid for his work so the bridge was left unfinished.